Joho in tears following the President Kenyatta directives to Jubilee leaders to frustrate him. - Bana Kenya News, Real African Network Tubanane. Home News Joho in tears following the President Kenyatta directives to Jubilee leaders to frustrate him. Joho in tears following the President Kenyatta directives to Jubilee leaders to frustrate him. President Uhuru Kenyatta today opened the Mtongwe channel and Mariakani Jubilee offices at Mariakani town. He also went to Samburu to back up the Kwale governor Salim Mvurya in his bid to remain in the governor sit. The president and his people provided very lengthy speeches of what the government is planning for Coast region. 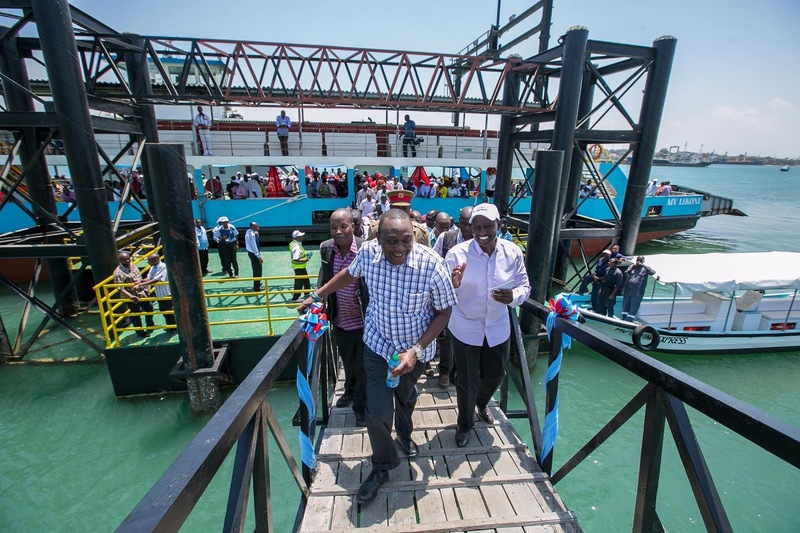 He rubbishes the claims that the Mombasa and Kilifi Governors talk more and chest thrust with nothing done on the ground following billions of shillings given by the National government. Read the main points that the Jubilee giants mentioned in the Mtongwe channel launch in Mombasa. Speeches from President Uhuru, Governor Mvurya, Gonzi Rai and DP William Ruto. “Governor Joho and Governor Kingi are all about talk and no action. They have offered nothing new. They have nothing to show for all the money they have been given to invest on your behalf. The only talk,” President Kenyatta spoke as he ended his tour that saw the launch of projects worth over Kshs 17 billion. “By investing in the Coast, we are showing that we care about the welfare of the people here. We take action to improve their lives –that is the difference between us in national Government and these governors,” the Head of State said. The President, who started his visit in the region by launching the Kshs 10.8 billion Witu-Lamu road in Lamu County, the Kshs 1.5 billion Sabaki-Marafa road, and the Kshs 2.3 billion Kakuyuni-Gongoni and Kakuyuni-Kilifi pipeline on Thursday, concluded by launching the tarmacking of the Kshs 2.05 billion Samburu-Kinango road in Kwale County. During the visit to the Coast region, the President – who was accompanied by Deputy President William Ruto – also launched the tarmacking of the 56-kilometre Bura-Mghange-Werugha-Mbale-Msau-Mtwamwagodi road on Saturday. Earlier today, President Kenyatta visited the town of Bamba – immortalised by the song “Safari ya Bamba ni machero” – where he launched the tarmacking of the 44 kilometres of Bamba-Mariakani road at a cost of Kshs 2.1 billion. Speaking during the launch of the Samburu-Kinango road, President Kenyatta affirmed his Administration’s commitment to uplift the lives of Kenyans through the implementation of projects in all parts of the country. “True leaders are those who work for the welfare of the people, not those who engage in endless political rhetoric at the expense of service delivery and development,” President Kenyatta said. Governor Mvurya and Mr Rai assured the President and his deputy that the people of Kwale will never be cheated to follow the Opposition again, saying they have witnessed and taste the fruits of development under Jubilee. “There is no need to join Kalonzo Musyoka, Musalia Mudavadi or any other Opposition leader who have failed to implement development even in their areas despite holding a very senior position in Government in the past,” Governor Mvurya said. He said Kwale residents will not agree to be remote-controlled from Mombasa by Governor Joho. The President also added that the Mombasa governor will look for somewhere to stay but not in Mombasa. The people of Mombasa have decided that its jubilee. "The governor needs to have manners or else we will make him follow what we said and be straight with other Governors. He is not superior to me" Said the president.